The world's biggest holiday begins January 31 and ends February 15. For anyone who has traveled Asia during the lunar New Year, they will be aware of this huge holiday. My first experience of it was when I was in Hawaii years ago. I was staying with some friends who asked me if I wanted to go to Chinatown in Honolulu to celebrate the New Year. I could hardly wait for the big event. When we got there the fireworks began to go off, and before it was over I was holding my ears for dear life and wishing that I could get out of the noise because it was so loud. Last year I was in China for this holiday. Millions and millions of people traveled by plane and train to be with their families. I went to the Western part of China to Chengdu. While I was there I went to the Tibetan area and stayed at the Sheraton. I was at the computer area and met a man who was working in China for his company out of Chicago. He told me that the factory that he worked at totally closed for two weeks. He said, "The people in America just don't understand how a country can close for two weeks. But once you have been there and experienced it you will get a sense of how important families are and why they all go home for this special holiday." I just talked to an American Chinese friend that told me even here in America she will celebrate the New Year by having four parties at her home. 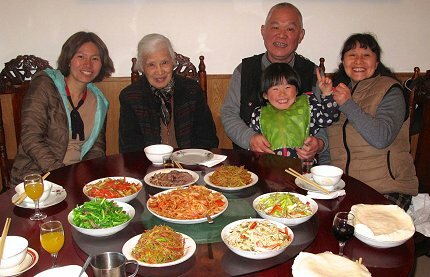 I met with a family in Chengdu for part of my New Year last year. One day we went to my friend's mother's family and had a big dinner. Another day it was to her father's family and yet another day we stayed at her home and her father cooked the most incredible meal for everyone. At family dinners such as this one, gifts of money to children are expected. Gifts to the children are part of the experience. If you have a job and are making money, you are expected to put some money in a small red envelope and give it to the children. My friends' daughter, who was three, took all the money that was given to her and her parents put it away for her schooling. 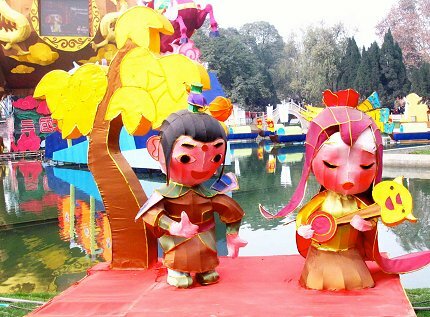 On the day of the Lantern Festival, parks are turned into destinations, with amusements and fun adventures for families and children. Toward the end of the two weeks there is a festival called the Lantern Festival. They turn parks into amusement parks with food, lanterns, and fun events for families to go to. February 15 will be the last day. That night the fireworks begin toward evening and go until midnight to mark the end of the holiday. If you live near a Chinatown and want a fun experience, check out the activities and join them for the biggest holiday of the year. If you are interested in traveling and seeing China, South Africa, or Peru with Dian Thomas, contact Dian by writing to info@dianthomas.com.